I love Thursday nights during Chorale rehearsal seasons. When we’re starting out we have new music in front of us full of unexplored time signatures and rhythms. At first, it all looks impossible. What was the composer thinking? Does it have to be so complicated? How can a group of singers, some experienced, some beginners, many a little seasoned or looking at a long break between that high school chorus and the present, ever learn the music, let alone master the nuances that will make a performance an experience for audiences to remember? I know we will because we have done it before. We’ll explore the notes, learn to feel the rhythms and dynamics of sound, then hear those very notes and rhythms as we’re falling asleep at night or walking in the woods with the dog. At first, it all seems like little bits and pieces. Then a rhythm takes form. Tonight, a section in John Rutter’s “When Icicles Hang” called “Good Ale” quickly took hold. Well, it is a drinking song, and we know how those repeat endlessly until the bottle is empty! A little analysis by Allison of the intervals and how one part relates to the other and a picture forms. Rutter has given us a drinking song with some subtle variations that make it more interesting than the song sung at the sticky bar during last call! I get it! Voices embrace the theme. We’re off! Just a little stuck on other parts, but little by little it all makes sense. Tonight Allison worked with us on dynamic changes in The Faure Requiem, and proceeded to show us how beautiful the sound can be as we layered part on part while paying attention to volume changes. We made some gorgeous sounds! 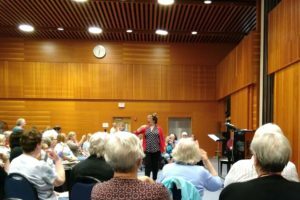 So good to see people I’ve known for years singing with the Chorale or in groups that preceded it: The Provincetown Choral Society, even a few from the Wellfleet Cantores of the 1980s. And now we sing with a group of 150 people who look at those pages of music in September and by December will have made them their own. What kind of love is that?